Bundle of Joy’s program is designed to serve the needs of the child and family. We recognize ourselves as partners to the parents, working together to help encourage each child to progress at his/her own pace. Our staff encourages positive self-confidence, self-esteem, competence in self-help skills and those inner controls and language abilities necessary for effective social interaction. Our programs emphasize the process of learning and discovery rather than the product. Daily activities are designed to encourage children to act upon their environment. We provide an environment rich in materials to explore, manipulate and discuss. Children are guided to questions, to discover, to think and to reason. No single area of development is stressed above another. Bundle of Joy promotes the growth of the whole child-emotionally, physically, socially and intellectually. Welcome to Bundle of Joy Child Development Center. For nearly thirty six years Bundle of Joy has left a positive footprint on the greater Richmond community. Thousands of children have experienced the excellent preparation provided by its dedicated faculty and staff. The best way to describe Bundle of Joy at the present time is that we are focused on excellence in quality of care, education and best practice in the area of early childhood education. We work with state and local agencies, other local preschools and early education programs, as well as higher education programs to help us evaluate all of our children. We create a learning community where children develop skills as building blocks to the next level of education. You are invited to tour our website or visit us on Facebook to learn the most up to date information about our programs. If you are look for a nurturing, and dynamic early childhood or after-school experience for your child Bundle of Joy is the place for you! Bundle of Joy Child Development Centers Inc. began with one center in Henrico County in 1976. Over the years the program has expanded its operation to four locations throughout the Richmond Metro Area. Bundle of Joy in now located in Goochland, Hanover and Henrico Counties. The founders, Mr. and Mrs. Womack, were pioneers of the industry. They opened a day care center when Mrs. Womack felt that children needed more space and structure than she was able to offer in her home. She received her degree in Early Childhood Education when these degrees were very new to higher education and began caring for ten children in a one room, two bath facility in the Lakeside area of Henrico County. Over the years, the one room facility grew to two rooms, then four, then eight then twelve classrooms. The center grew mostly from word of mouth advertising provided by the enrolled families. After opening a second school in Glen Allen area two of the Womack daughters, Kim and Kelley took on active roles in the business. Kim Hulcher holds a Master’s Degree in Teaching from Mary Baldwin College, and Kelley Mulcunry holds a B.A. in Interdisciplinary Studies with a concentration in early childhood development from the University of Alabama. In 2001, two existing schools were acquired. The first was a school in the Kings Charter area of Hanover County, now known as our Atlee school. The second was in eastern Goochland County in the Centerville area. Today Kelley and her husband Andy own and actively operate the four schools. Andy graduated from the Virginia Military Institute with a B.A. in History and received his Law degree from The University of Alabama. Prior to joining Bundle of Joy, Andy was employed by the University of Virginia Medical Center as Associate Adviser to the Executive Vice President. Kelley and Andy have 2 grown boys who both attended Bundle of Joy ~ Glen Allen. 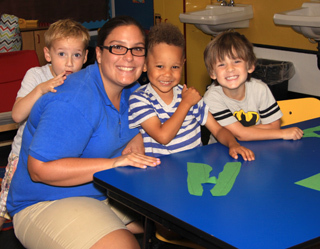 Bundle of Joy provides infant, toddler, Preschool, Pre-Kindergarten and Afterschool care services to approximately 600 children and employs approximately 125 staff members. We are and continue to remain focused on ways to best meet the needs of the families of Virginia. When you visit any of our schools you will quickly see we are not a daycare. We are very much a school offering structure and opportunities for creativity. With the help and partnership of our families and wonderful, dedicated staff members, we are able to do what we love to do each day by providing a place where children can grow and learn while they are in a safe and nurturing environment. We believe that developmentally appropriate early childhood experiences foster wonder and a life-long love of learning. We also believe that children build upon their existing knowledge through inquiry and shared experiences. Therefore, we strive to provide authentic learning opportunities through creativity and purposeful play. Parents are informed of their child’s progress throughout the day through an app called HiMama. 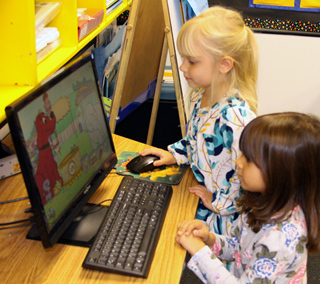 Academic and social assessments are conducted twice per year and PAL’s assessments are performed at the Pre-Kindergarten level. Our goal is to identify and strengthen areas of weakness and to help prepare each child develop a love of learning for Kindergarten and beyond. At Bundle of Joy we teach children STEM & STEAM through planned and spontaneous experiences. Each day Bundle of Joy teachers and the children are engaged in supportive and encouraging learning interactions through the High Reach Curriculum. High Reach includes a variety of hands-on lessons, purposeful play, and rotating learning centers full of meaningful experiences which touch on a variety of domains including the STEM/STEAM concept of learning. Teachers develop math games to coordinate with a favorite children’s book, have a water table set up to explore different materials that may sink or float, plan the dramatic play and block area as a grocery store, introduce natural materials to the art area that go along with the seasons, or even set up a hand held juicer to make fresh lemonade. These experiences are unplanned natural experiences that you don’t want the children to miss! 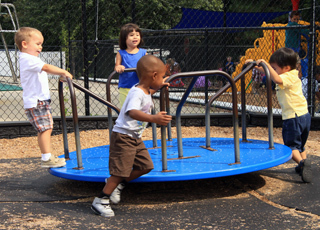 For example, while a group is outside on the playground, they may notice the sun and moon are out at the same time during the day! While on a nature walk, children may notice that some trees drop acorns and some trees do not. One child may notice that it appears like he has a different number of goldfish (snack) than his friend. The appearance of goldfish spread apart on a plate may give the appearance of a greater number. It is here that a teacher has the opportunity to incorporate Math into meal time. With all these examples, teacher stay aware and are flexible to take advantage of something exciting and new happening in a child’s world. Teachers will turn spontaneous experiences in to teachable moments by asking questions and allowing for the children to problem solve. The addition of the Arts to STEM to create STEAM is about incorporating creative thinking and applied arts in real situations. Art isn’t just about coloring, glitter, or painting a picture. Art is about discovering and creating ingenious ways of problem solving, integrating principles or presenting information by highlighting the Arts (including music!). Science and Math are deeply embedded in the Arts! Whether you prefer STEM or STEAM the underlying principles and practices are very much the same. It is all about integration of the pillars: Science, Technology, Engineering, the Arts and Math.